It is a constant struggle in the modernized slavery plantation with a sedulous state of divine consciousness. Slavery and involuntary servitude is legalized under the 13th Amendment and contrary to it the universal Declaration of Human Rights completely abolish all forms of slavery, servitude, and the harsh infliction of cruel and unusual punishments. I am of the efficient and proficient state of Divine Element and I am to project positive energy into the atmosphere. I am delighted to receive your newsletter last week. I have noticed that no one spoke / wrote about Georgia’s peaceful refusal to be modernized slaves or involuntary servitude. At the appropriate time a mass movement of resistance comrades at Autry State Prison sat down stood up for their rights to refuse being slaves and forced involuntary servitude under the 13th Amendment. The Universal Declaration of Human Rights completely obliterate / abolish all forms of slavery, servitude and the harsh inflictions of cruel and unusual punishment. These brothers definitely deserve to have Black Power Fists and salutes as Warriors in a righteous cause. I have not heard or read anything about them anywhere. Why not? I encountered several of them at Hancock State Prison after they was maliciously and sadistically victims of vindictive retaliation acts by prison officials. They was deprived of the due process rights and the Universal Declaration of Human Rights equal protection of the law. Power Fist and salutes goes out to the brothers who stood in this for a righteous cause in our ongoing struggles against slavery, involuntary servitude and the harsh inflictions of cruel and unusual punishments in the forms of Prisons. 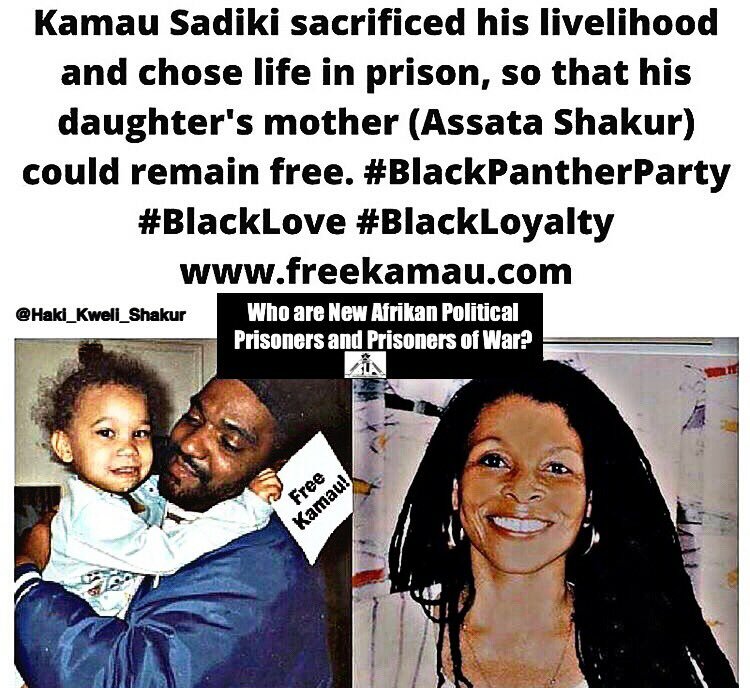 The brothers need to know the sacrifices are appreciated and they need to be recognized and fully acknowledged in our efforts to stop / terminate the slavery of black people and people of color. They was transferred from Autry State Prison to Hancock and placed in the Tier II program administration segregation [solitary confinement and deprivation of all property — ed.]. Many fabricated charges was vindictively brought against them and they did not receive fair hearings. It is all malfeasance and misfeasance against them for courageously opposing the established government of white supremacy. Continue to fight to win in our mutual struggle. Be safe and take care. 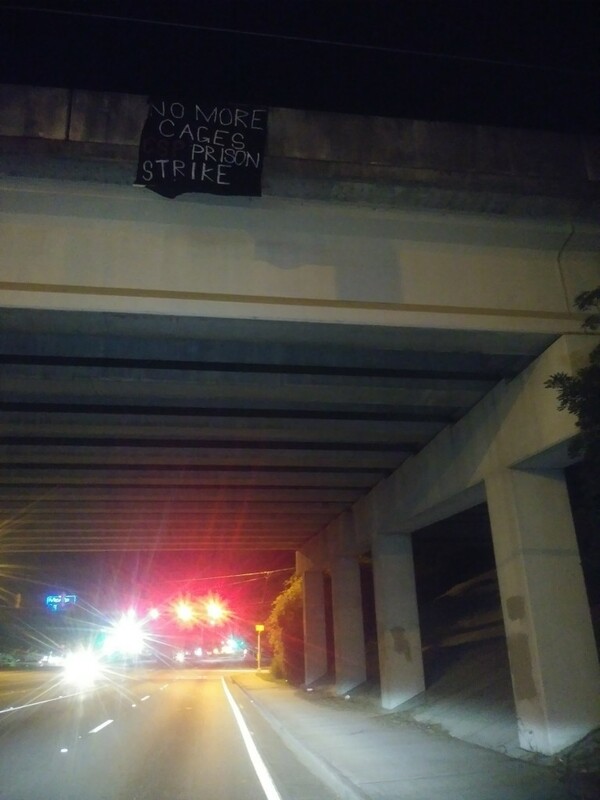 Atlanta banner drop over Freedom Pkwy. 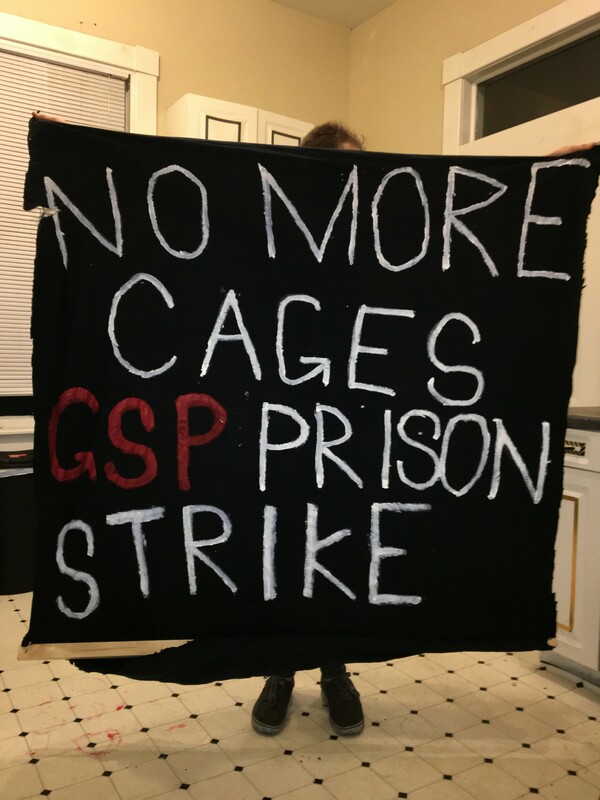 Prisoners in Georgia are on strike! 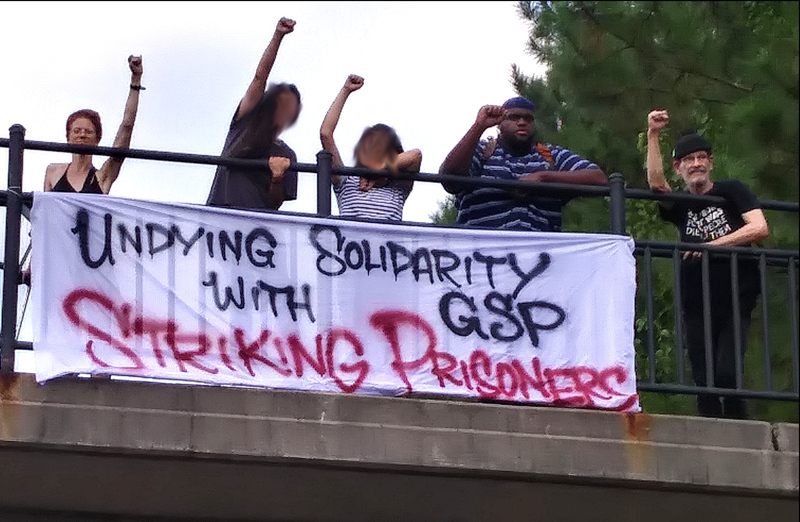 When we heard that people in Georgia State Prison near Reidsville, GA were participating in the national prison strike, we wanted to show our solidarity. 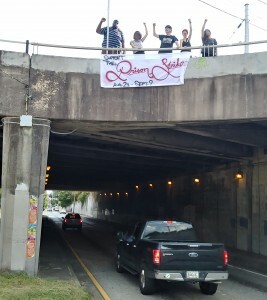 Atlanta banner drop over Moreland Ave.
As we placed our banners, we heard many car horns honking in support. Awareness and support for the strike is spreading! 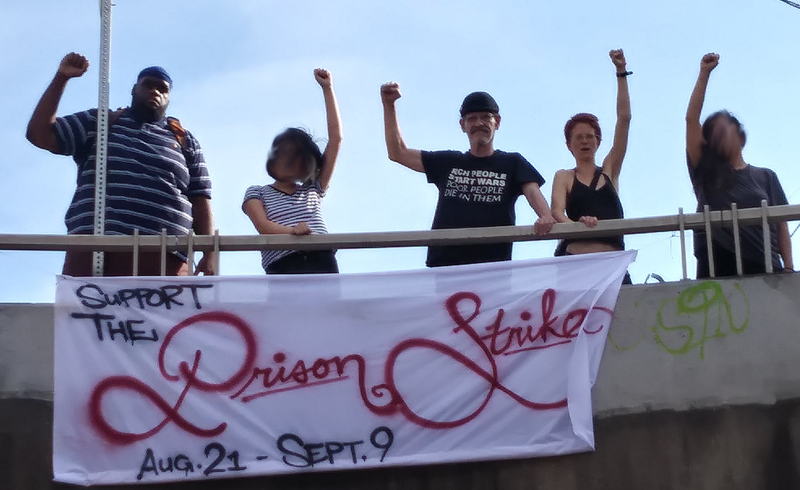 In 2010, prisoners all across the Georgia prison system coordinated an uprising which spanned many facilities and involved cooperation between prison organizations and between black, Latinx and white inmates. They brought the prison system to its knees. 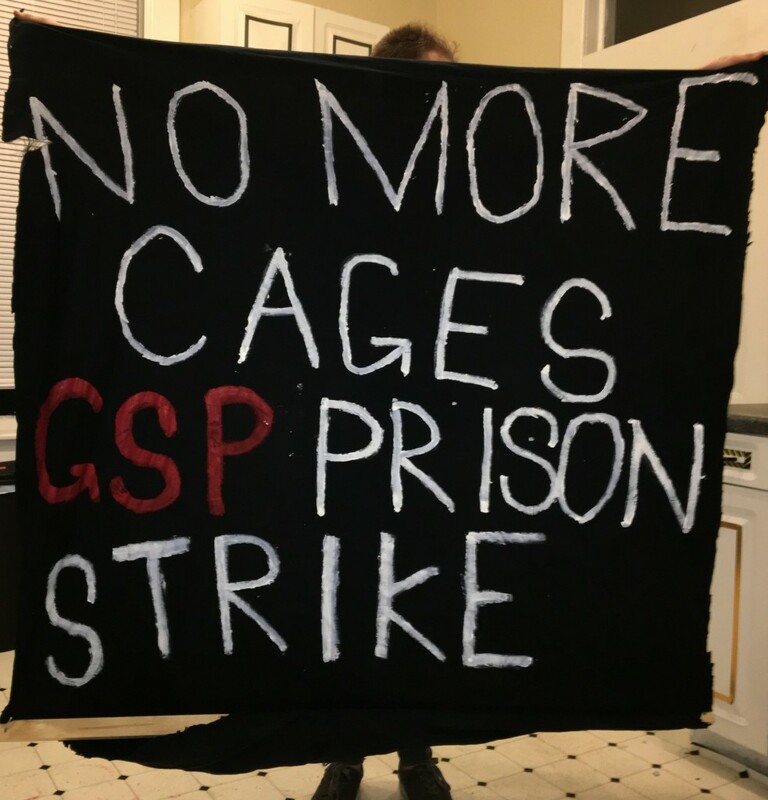 Now, inmates are Georgia State Prison are continuing this tradition of resistance in Georgia. We stand with them. 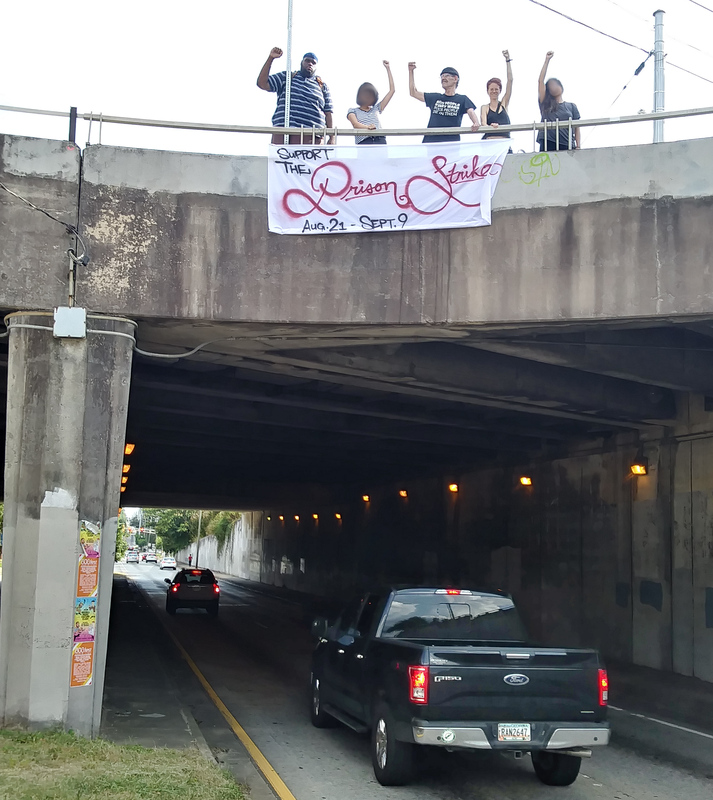 Banner dropped in Savannah over Victory Dr. Prisoners: when you fight inside the walls, we will fight along with you on the outside! Support J20 Defendants: Demand Feds Drop the Charges! Protest at the federal courthouse to demand that the charges against the remaining J20 defendants be dropped! 230 people were mass arrested during demonstrations against Donald Trump’s Inauguration. The arrests were made by use of a “kettle” technique, trapping everyone on a street and arresting en masse. 214 of these arrestees were charged under the Federal Riot Statute. On April 27th 2017, multiple additional felony charges were added. One trial group was acquitted of all charges, and the Attorney’s Office dropped charges against an additional 129 defendants on January 18, 2018. After it was disclosed that the prosecution covered up evidence that would have helped the defense, another round of dismissals followed. There are still close to 40 people who are being prosecuted with multiple felonies and face up to 60 years in prison.